Last week, I spent several days in San Fran at Dreamforce 18, Salesforce’s annual customer and partner party / gathering. While there were a total of 2,700 sessions, with many, many announcements made, two big takeaways clearly were center stage – Customer 360 and the Einstein Voice initiatives – with a broad range of 2nd tier announcements including partnerships with Apple and AWS. For me, however, the biggest takeaway was a deeper appreciation for the amazing business model that Salesforce has built, and a richer understanding of its sustainable foundations. Last weekend, prior to traveling to Dreamforce, I revisited my first Dreamforce in 2006, some twelve years ago. How thing have changed, heh? (both for the company, and the enterprise software industry in general.) Luckily, I was able to find a summary research piece I co-authored back then – that highlighted that 5,000 users attended that event, with the vast majority enthusiastic Type A sales execs and leadership. One can’t forget that at that time, Salesforce was exclusively a Sales Cloud provider, with a powerful yet still emerging CRM solution in the midst of its battle with Siebel Systems for CRM market leadership (although Siebel had been acquired by Oracle roughly 12 months prior). The big news out of Dreamforce that year focused around Salesforce’s upcoming Winter ’07 release that promised expanded functionality, ease of customization and embedded mashup capabilities, AppExchange and the first release of the Apex programming language and platform. All-in-all, a lot of “stuff” – some of it very strategic long-term. March forward a dozen years to 2018, and one can only be astounded by Salesforce’s significant and consistent growth, as well as the astounding evolution of the Dreamforce event itself. During this span, Salesforce revenues have grown from $497 million in FY07 (end of January Fiscal Year) to projected FY19 company guidance of $13.175 billion. Registered attendance at Dreamforce this year topped 170,000 (with titles ranging from Sys Admins to F100 CEOs), with an estimated 10 million + viewing the various keynotes online. Where there was once one cloud (and a narrower portfolio of development tools and associated integration capabilities), Salesforce now focuses across four major ones (plus several minor ones), each of which are at significant scale: Sales ($4.0B+), Service ($3.6B+), Platform ($2.5B+), and Marketing / Commerce ($1.8B+). While Salesforce does not like to think of itself as a “legacy” company per se – in many respects the leadership is not given its due in regards to the amazing story of adaptation and evolution that has occurred over the past 20 years (since its founding). The company has transformed itself from a niche cloud-based CRM pioneer into an formidable enterprise-wide application and platform behemoth for all things related to the “customer.” Change is good, but change is hard. Keeping everybody on board with the expanding vision I am sure has not been trivial. Recruitment of additional leadership has been critical – and in this regard, I was quite impressed with the next-generation that is increasingly taking the reins. 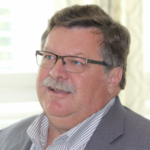 The very success that it has had in launching all of its various clouds cuts to the very heart of why Customer 360 is so critically important. Customer 360 is Salesforce’s answer to the long sought after “holy grail” of creating a single-view-of-the-customer – connecting the various “islands of automation” that have grown up – whether it be separate systems and data repositories for sales, marketing or service. What Customer 360 provides is immediate, real-time access to data across these systems, with the ability to create a single view of the customer. The way that it works is that Customer 360 leaves the data in its original data repository, and connects and manages all relevant customer data and profiles across Salesforce apps using a common Customer 360 ID. In this sense, Customer 360 reinforces Salesforce’s increasingly federated view of data to help create a single view of the customer through Customer 360. No doubt, creating a 360 view should help drive significant add-on business for Salesforce (see below), as who wouldn’t want to 1) better understand their customers and customer behaviors, and 2) drive more personalized sales and marketing campaigns, and connected shopping experiences. The challenge for Salesforce is that from a marketing and branding perspective, this is well worn territory, which will only heighten the need for flawless execution. In reviewing my notes, I absolutely agreed with Bret Taylor, President and Chief Product Officer, who shared in a special Analyst Visionary session early Tuesday morning that “the platform shift to AI is one of the biggest in 10-15 years.” Einstein Voice was front and center as Salesforce’s next volley in the race to the 4th Industrial Revolution. My take on it is that while Salesforce demonstrated some advanced voice recognition capabilities, the bigger impact was its ability to impact a range of business workflows, which makes it appear to be a visible winner. More importantly however, the broader incorporation of Einstein (AI) analytic capabilities across the full range of the Salesforce portfolio of products suggests that a new embedded AI platform layer may be emerging, and this applies not only to Salesforce but to other enterprise apps vendors as well. Rather than general purpose AI engines, these new AI platform layers will need to be very functional specific so that they truly understand the dynamics of the domain that they are supporting. I’ll be pursuing this line of thinking further in future research. Stay tuned. 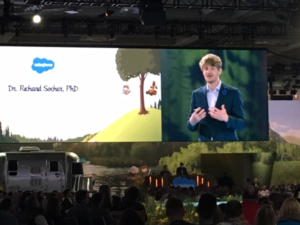 One of the great treats of the conference was joining the Investor (Wall Street Analyst) sessions on Wednesday afternoon – as I walked away better understanding why the Salesforce train stays so mightily on its tracks, year after year. Having worked in subscription businesses for most of my professional career, I was truly impressed by how well Salesforce leverages its highly recurring subscription business model, which drives amazing P&L visibility and predictability. In fact, 80 percent of next year’s revenue is already in the can, with 60 percent already visible two years out. More importantly, the presentations helped demonstrate why Salesforce has significant upside potential on a go-forward basis. No doubt the trend toward digital enablement is part of the answer. But a big part also has to do with its strong retention model, and how it generates incremental new revenue from the base. While new logos have long contributed approximately 27 percent of new incremental growth each year, the revenue mix coming from the installed base is evolving significantly over time, and to Salesforce’s benefit. In FY17, 57 percent of the incremental revenue that came from the installed base was from selling additional seats and upgrades (all highly profitable), with the remaining 43 percent coming from new products. In FY19 (that will conclude at the end of January), new product sales will reach 51 percent – as Salesforce is having greater and greater success cross-selling its growing arsenal of functional clouds and associated capabilities. 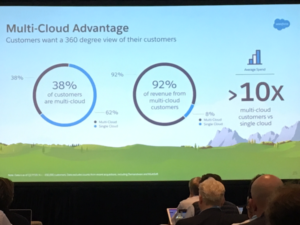 So far, 38 percent of its customers are multi-cloud – but more importantly, they drive 92 percent of revenue, with these customers typically spending 10X what single cloud clients do. And clearly the longer-term trend is toward more and more customers having multi-clouds. This should translate into big bucks going forward. What this all means is that Salesforce looks to have a continuing runway of at least 20-25 percent top-line growth ahead of itself (even with the diminishing impact of scale on growth), driven not only by adding new customer logos and selling add-on seats into the installed base, but cross-selling its multi-cloud portfolio. In this regard, Customer 360 should be a real winner that helps create significant upside demand. In sum, there is growing competitive threats for Salesforce, especially in the CRM and marketing arenas, with SAP, Oracle, Microsoft and Adobe all on the march. Further, the breadth of the company’s portfolio is getting very wide, which only increases operational risk. In such an environment, I wouldn’t doubt some hiccups along the way, due to transitional issues – especially as senior leadership rotates to the next generation. However, the net of it is that Salesforce is a well-oiled machine – and appears well positioned to reach or exceed its FY22 goal of $21-23B in revenue.